Indominus might’ve grabbed our eyeballs and our cash this summer, but genetically modified raptor-rexes with an insatiable lust for human blood aren’t the only badass new dinos on the block. 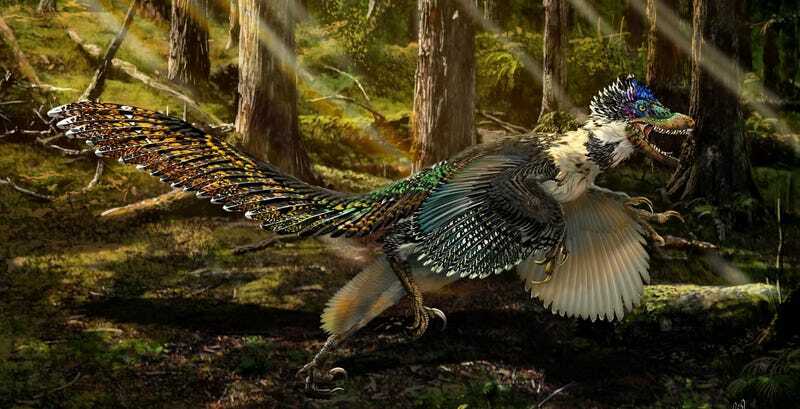 In fact, Zhenyuanlong suni, a Velociraptor cousin that looks like a tortured peacock on steroids, is arguably even cooler, because it actually existed. Dredged out of the ground by paleontologists working in the western part of the famously dino-ridden Liaoning Province in China, Z. suni is the largest feathered dino yet to have a well-preserved set of bird-like wings. But even more fascinating than its wings are the long, quill-like feathers that decorated the creature’s body. Normally, when paleontologists talk about feathered dinosaurs, you’d be better off imagining an animal that’s had the misfortune of sprouting pubic hair all over its body. Feathers simply weren’t up to snuff 125 million years ago. That is, until now. This remarkably well-preserved lizard-bird sported a dense and extravagant plumage on its wings and tail. At 5 feet long, paleontologists don’t think Z. suni could’ve actually taken to the sky— at least, not using the same muscle-driven flight as modern birds. We really don’t yet know what its oversized wings and fancy feathers were about. Perhaps it used them to attract mates, or scare the living bejeezus out of all the other creatures in the forest. But one way or another, this is an actual dinosaur that actually existed, and it’s showing us just how many Cretaceous mysteries are still buried in the ground. If I had to guess, I’d say trainable, pack-hunting feathered killing machines are going to be featuring prominently in the next Jurassic movie. How could Hollywood miss the opportunity to cash in on this? I certainly wouldn’t. You can read the full, open-access scientific paper here.